The 35-year-old and her two-year-old son have been missing since Saturday. Aoife Ni Raghaill, from Connolly Square in Bray, was last seen with her son Oscar in Dublin city centre on Saturday night. Aoife is described as five foot four and slim, with shoulder length, brown hair and sallow skin. When last seen, she was wearing a white dress and a cardigan. Anyone with information on her whereabouts is urged to contact gardaí at Bray on 01 666 5300. * No photos available at the moment. GARDAÍ HAVE ISSUED an appeal for public assistance in tracing the whereabouts of a mother and infant child from Bray in Co Wicklow, who have not been seen for three days. Aoife Ní Raghnall, 35, from Connolly Square, Bray, and her two-year-old son Oscar were last seen in Dublin city centre on Saturday night last. Aoife is 5′ 4″ in height, with brown shoulder-length hair and sallow skin. She is described as being of slim build, and was last seen wearing a white dress and a cardigan. Oscar has short, blond and wavy hair. Anyone with information on their whereabouts is asked to contact the Gardaí in Bray at (01) 666 5300 , the Garda confidential line at 1800 666 111, or any Garda Station. Trying to establish correct spelling of the surname!! Ní Raghaill comes up with the most news items on a google search!!! The Gardaí at Bray are anxious to trace the whereabouts of Aoife Ni Raghaill (35 yrs) and her infant son Oscar (2 yrs) from Connolly Square, Bray, Co. Wicklow. 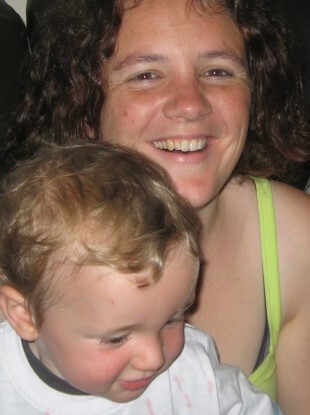 Aoife and Oscar were last seen in Dublin City Centre on Saturday night (20/8/11). Aoife is described as 5’4” in height with brown shoulder length hair, sallow skin and of slim build. When last seen she was wearing a white dress and a cardigan. Anyone with information is asked to contact the Gardaí at Bray 01 666 5300 , the Garda Confidential Line 1-800-666-111 or any Garda Station. Twiglet wrote: Trying to establish correct spelling of the surname!! For now I have changed the spelling of the surname to "Ní Raghaill" as this is the spelling used on the Garda Síochána website!!!! I know Twiggy,lots of typos in news items it seems !! Anyway fab news, found alive and well !! A mother and child reported missing recently have been located safe and well today. Gardaí have thanked the public for their assistance in finding Aoife Ni Raghaill, 35, and her young son Oscar, 2, from Connolly Square, Bray, Co Wicklow. * reportedly in Connemara !